Plastic Ticket Sleeves - Small Quantity Orders For Individual or Personal Use. Big Size Plastic Ticket Sleeves - For 4x7 5/8" Tickets or Entrance Passes. Great For Personal or Individual User! Material: Vinyl Plastic. Clear On Both-Side Of Pouch. 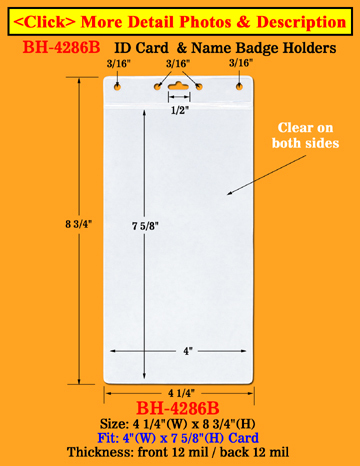 We have a great selections of big size plastic ticket sleeves or ticket holders available for small order online. No matter it is for individual or personal use, you can buy online with our easy and fast shopping cart. No minimum order required to buy. The holes on the sleeves can fit most of name tag holders, badge clips, swivel hooks, double ended lanyards or round cords. A great designed plastic ticket sleeve or vinyl pass holder at a low price!